Murphy went from foster to forever home here about a month ago. He didn’t know the difference, I actually think he knew before I did that I would adopt him. He knew he was home that first night back in June when I had to carry him upstairs because he didn’t know how to navigate the steps and put him in my bed. He’s been a happy dog ever since. The adoption was just a formality. Today, October 8th is his first birthday. 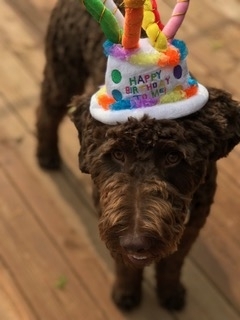 We celebrated by going to the pet store for some special treats and of course a birthday hat. He’s so good natured, VERY social, he wants to be friends with every person or dog he meets. Cats are for chasing. He would be a good candidate for a Therapy Dog and that may be in his future. For now he’s still full blown puppy and has to slow down long enough to learn a few more manners.